LABYRINTH BOOKS Toronto Comics MANGA and GRAPHIC NOVELS - TORONTO: NEW BOOKS ARRIVING WED JULY 31st!!! NEW BOOKS ARRIVING WED JULY 31st!!! 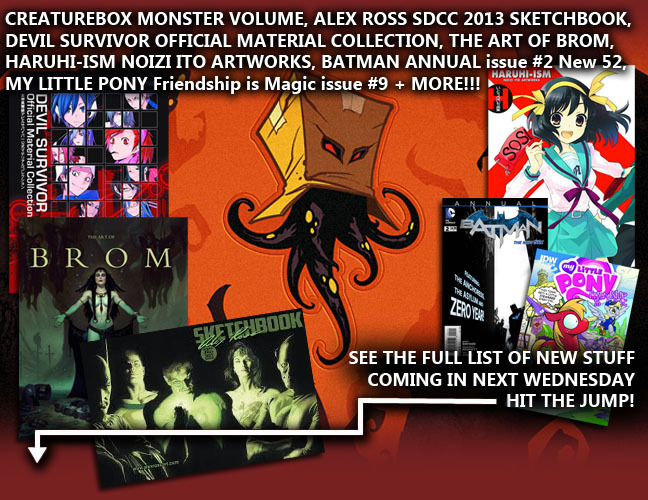 - We've got two new sketchbooks in store now from this year's San Deigo ComiCon! The first is by Alex Ross, and the second is by Bill Sienkiewicz! - The most comprehensive retrospective collection of Fantasy Artist Brom arrives this week! Check out 'The Art of BROM' featuring 30 years worth of the man's work! - At long last the CREATUREBOX MONSTER VOLUME is now available in store! Grab them while they last! - The hit RPG 'Devil Survivor' finally brings over its official artbook to our shores courtesy of Udon! Check out this ultimate companion featuring character designs, promotional artwork, storyboards and a detailed demon guide! - Check out a collection of artwork by Noizi Ito, the artist behind Harhi Suzumiya and the SOS brigade in the original novels! 'Haruhi-ism' contains book & DVD covers, magazine pinups, rare promo images and more! - Carbon is a book that collects the best recent graphic works by artist Mark Shultz, and volume 1 arrives this Wednesday! - The second volume of Spectrum's Fantastic Art Live arrives this week featuring the work of 6 selected artists including Peter de Sève, Tara McPherson and more! - A new hardcover volume collecting the wonderful new art by Sam Keith arrives this Wednesday that's a must have for fans or anybody looking for fantastic images from a veteran comic book artist! - Batman Annual #2 arrivies this week featuring a special Zero year tie-in! Also alongside it is the Detective Comics Annual #2 as well! - The new arc of My Little Pony Friendhsip is Magic arrives with issue #9 bringing the bashful Big McIntosh into focus! - More volumes of the first collected Witch Buster are coming in alongside the new second volume collecting books 3 & 4! - Invincible Volume 18 collecting issues #97-102 arrives this Wednesday with Mark Grayson now faced with the choice of whether he will continue on as a hero, or pick the other side?! - New Square Enix PlayArts Kai figures from Batman Arkham City arrive this week; and we've got Harley Quinn and Poison Ivy! - Harley Quinn fans also have a new stylish T-Shirt to look forward to done as a bombshell motif, 3 sizes are available! - New Bandai Candy Toy Gundam Converge figures are arriving this week featuring mobile suits from Crossbone, Z Gundam, Gundam Unicorn, and the original Mobile Suit Gundam! - New POP Figures are available now at our store from the new Disney line from Alladin, Up!, Jungle Book & more! Also two new POP figures from Man of Steel, and also Wacky Wobblers from the Muppets!